This article is about the historic Italian Army Centauro Armored Brigade. For the historic Italian Armored Divisions, see 131 Armoured Division Centauro and 136 Armoured Division Centauro II. The Centauro Armored Brigade was an armored brigade of the Italian Army. Its core units were Tank and Bersaglieri battalions. 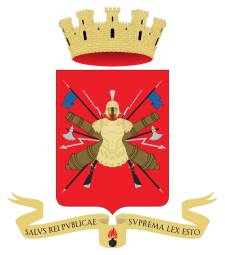 The brigade's headquarters was in the city of Novara, while most of its units were based in nearby city of Bellinzago Novarese, both located in the province of Novara. 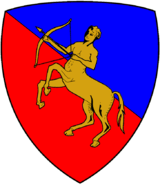 The brigades name comes from the mythological race of half human-half horse creatures named Centaurs. On 31 October 1986 the Italian Army abolished the divisional level and brigades, that until then had been under one of the Armys four divisions, came forthwith under direct command of the Armys 3rd and 5th Army Corps. As the Centauro Armored Division carried a historically significant name, the division ceased to exist on 31 October in Novara, but the next day in the same location the Centauro Armored Brigade was activated. The new brigade took command of the units of the Curtatone Armored Brigade, whose name was stricken from the roll of active units of the Italian Army. During the 1990s the brigades structure fluctuated wildly as the Italian Army drew down its forces at the end of the Cold War. 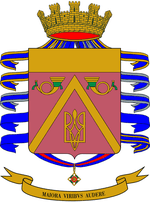 On 5 November 1990 the 11th Infantry (Training) Battalion Casale in Casale Monferrato joined the brigade, followed on 1 June 1991 by a medical battalion from the disbanded Goito Mechanized Brigade. On 1 July 1991 101st Tank Battalion joined the Garibaldi Bersaglieri Brigade and transferred to Persano in the south of Italy. In the following year the 1st Tank Battalion was renamed 31st Tank Regiment without changing the actual size or composition of the unit, similarly the 9th Self-propelled Field Artillery Group became the 131st Self-propelled Field Artillery Regiment. The Anti-tank company was disbanded and the Sapper company merged into the Command and Signal Battalion. In 2000 the Logistic Battalion and Medical Battalion were transferred to the Army Logistic Brigade. The 2nd Bersaglieri Regiment was disbanded in 2001, followed by the brigade and the 21st Infantry Regiment on 5 October 2002. The remaining units were distributed among other brigades: the 1st Cavalry Regiment joined the Alpine Brigade Taurinense, the 3rd Bersaglieri and 4th Tank Regiment joined the Armored Brigade Ariete, while the 52nd Self-propelled Artillery Regiment entered the Field Artillery Brigade.